DONETSK, November 7. /TASS/. Ukrainian forces have opened fire at the settlement of Mineralnoye on the outskirts of Donetsk from a combat unmanned aerial vehicle (UAV), the people's militia of the self-proclaimed Donetsk People's Republic (DPR) said on Wednesday. "Ukrainian forces used a combat unmanned aerial vehicle to open fire at the settlement of Mineralnoye. According to preliminary reports, one local resident was injured. Information about damages is being verified," Donetsk News Agency quoted DPR people's militia as saying. DPR people's militia added that self-defense forces destroyed the UAV and noted that they have video recordings obtained from the unmanned aerial vehicle's flash card that confirm its deliberate use against the peaceful population of Donbass. DPR's representative at the Joint Center for Control and Coordination earlier said that Ukrainian forces shelled the settlement near the Trudovskaya mine. 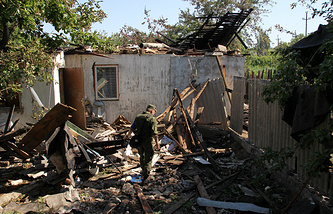 As a result of the shelling, a residential house was set on fire.